How is this for a coincidence? A few days ago on our way to Asheville to scout the Farmer’s Market there and see what all we could come home with I stopped by the mailbox and got my copy of Bon Appétite. I leaved through the magazine on my way and noticed an article about one of those “chef challenges” where chefs are given one or several ingredients and told to come up with some sort of interesting recipe. This time it was canteloupes and one of the chefs contributed canteloupe gazpacho. “Wow, I thought,”and read the article out loud to Jack. 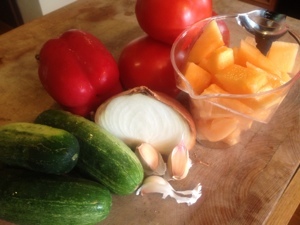 We both agreed that we would buy canteloupe and try our hand at canteloupe gazpacho (we were going to buy them anyway as the Farmer’s Market has canteloupe from South Georgia in by the truckful). So here is where the coincidence comes in. We decided to have lunch in downtown Asheville and chose Modesto’s, an Italian bistro with outdoor seating. 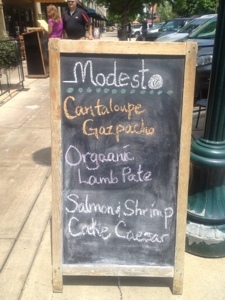 Imagine my surprise when I saw Canteloupe Gazpacho featured first in their menu blackboard. Of course, I ordered it and it was delicious. Today I made my version – not exactly the same because Modesto’s would not give me the recipe although I whined and begged in my most persuasive best, but it was very tasty, even de-li-cious! Definitely a keeper. Peel the tomatoes, peel and seed the cucumbers. Seed and cut the bell pepper in chunks, chop up the onion. The mint and the parsley do not need to be chopped up! You won’t be able to fit all of the cut up vegetables in the food processor, so you need to put half of them in the food processor, process until you have a uniform, thick mix. Pour the mixture into a large bowl. Do the same with the other half. Add the vinegar, oil, salt, and paprika and stir. Refrigerate for at least one hour and up to three days to meld the flavors. Stir before serving.